I first printed guides on a piece of paper so I would know where the printed image would be and taped down the tissue paper. 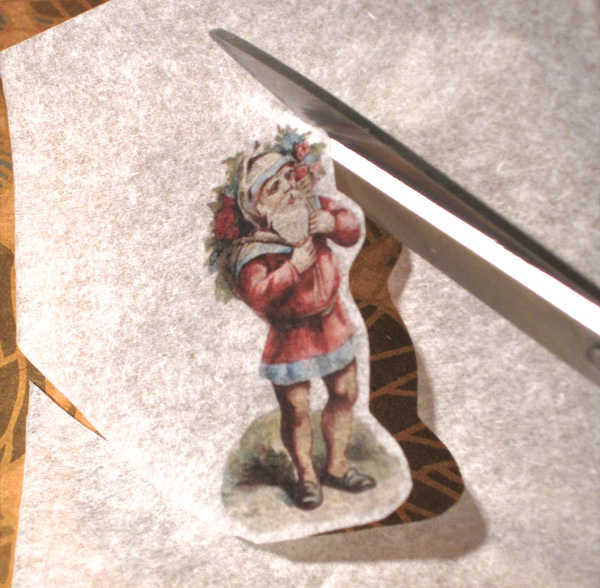 Once you have the tissue paper secured, print your image and cut it out. You’ll want to leave as small a border as you are able. Next, subject your image to heat. You’ll find that the wax on the wax paper starts to melt and you can suddenly see the ink come through the paper sharply. At that point, you’re done. Carefully peel the wax paper away (with a mental drumroll!) and reveal your printed candle. 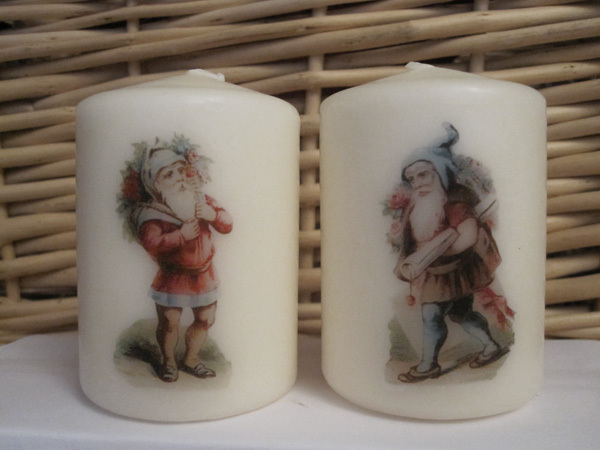 I liked both sets of candles because they were christmassy, but in a subdued way. And they were gorgeously vintage. I have tried your candle transfer method and just love the results! 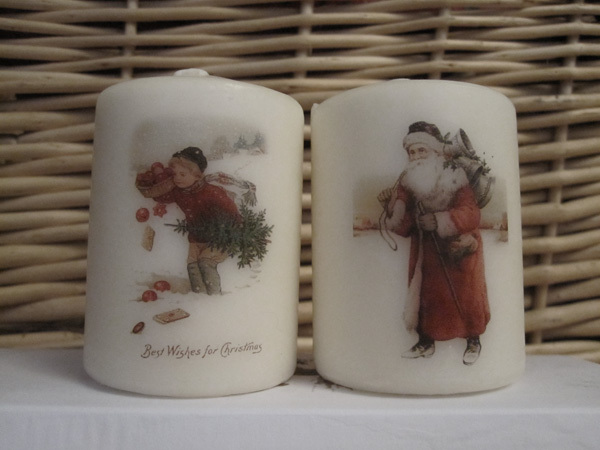 I particularly like your Christmas vintage candle transfers, especially the young boy with the tree. I thought I had seen this previously on the Graphics Fairy, but despite searching I can’t find it. Could you help please? Thank you. I’m glad you enjoyed making candles with this method. The young boy does look like something you would find via the Graphics Fairy, but I found it here. There are loads of other gorgeously vintage images there as well. Hi! if I dont have an embossing tool and opt to use the stove, how do I go about getting that done? do I just roll the candle with wax paper around over one of the hot plates. Heat obviously turned up high. Love your ‘transfering ink to candles’ project. I’ve often wondered how it was done. I will be doing this for gifts. what are the other terms of tissue paper? is it the same as the onion papers? thanks!! I’m not sure of other names for it. It’s the kind of thing that you can buy at the dollar store for wrapping or stuffing gift bags with. Hi, call me crazy well just not really crafty but what is the tissue paper used for again? Dont u have a photo then place on candle ink side out then wrap with wax paper then heat. So where does tissue paper come in? I’m wanting to do this for a mothers day gift. Thanks for any help. The tissue paper melts into the candle. It’s pretty amazing, actually, since you can’t see it when the project is completeled. 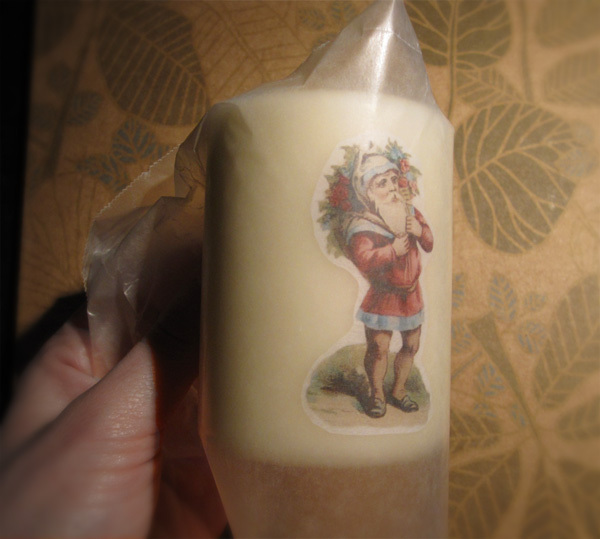 The wax from the wax paper and the wax from the candle both melt slightly and blend over top of the wax paper with your image on it. I’m so happy that this worked out for you! Your candle looks great! Hi I was just wondering where do u get the wax paper? Is it just the wax paper chef’s use for sugar crafts? OMG! I had been racking my brain for the perfect hostess gift for my baby shower. The candles I just made ROCK!!!! Thanks for the instructions. I’m so happy to hear that Lynn! If you send me the pictures then I’d love to post them here. morgan(at)lovelydesigns.ca. Hi, I really love this idea and would love to try it but im a bit stuck. is the image printed onto the tissue paper? i dont understand where the tissue paper comes in?? “Transfer” may be a misleading word. The image is printed on the tissue paper and gets embedded into the candle between the two warmed layers of wax, the candle wax and the wax paper. Hi Caz, thanks for your question. If you have shiny and dull sides of your tissue paper, you’re you probably too fancy. I found that this worked best with dull (regular, cheapest) tissue paper found at the dollar store. 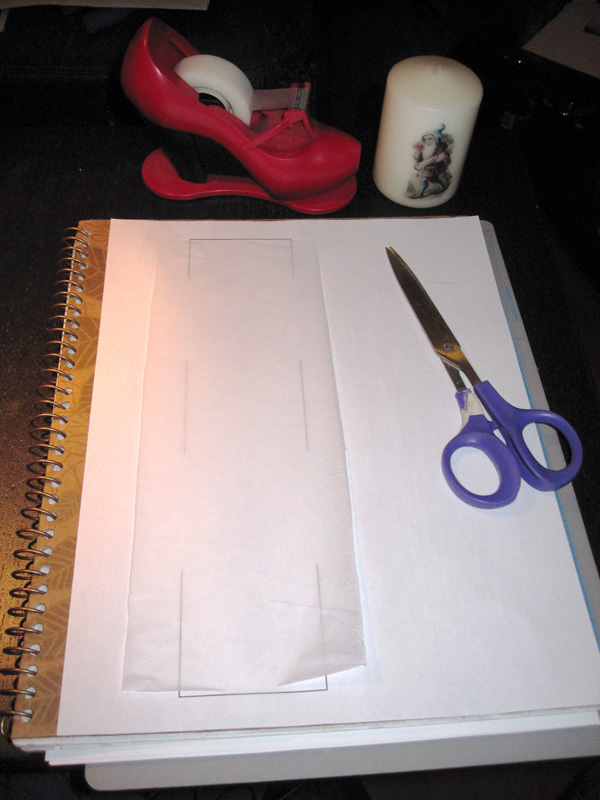 I tried this once with heavier, more luxurious paper and it didn’t have as pretty results. You want to have the thinnest, cheapest paper. Wax paper typically has wax on both sides of it. However, if this is not the case with yours then place the paper on the candle wax side down. I found that by wrapping the wax paper tightly and gripping it on the side away from the candle pressed it sufficiently in place to avoid air bubbles. It also helps to periodically rub the images against the candle as it warms. Hi, I tried this but using Greaseproof Baking Paper and could not get the image to come onto the candle – the candle just ended up melting? Also what setting do you use on the printer to print onto tissue paper. Any tips you could give would be appreciated. I don’t know the properties of Greaseproof paper, but the purpose of the wax paper that I used was to sandwich the image (and tissue paper) between the candle wax and the wax on the paper. The two melt/soften slightly and that’s how the image gets embedded in the candle. I used my ink printer, although I can’t see why a toner printer wouldn’t work and didn’t mess with my settings – left them just as I would if I was printing on regular paper. Give it a try with thin, cheap (dollar store) tissue paper and wax paper and let me know how it goes! Yes, if anyone is in Australia and has tried this, please let us know precisely what products were used. It seems that the materials where you are, are quite different from what I have at my disposal. What a wonderful response! I’m so excited for you. Please do let me know how it turns out! Does your home business have a website? I have not had any problems with these candles. Keep in mind that the tissue paper is saturated with wax. Having it catch on fire seems to be a non-issue. Also, since this technique works beautifully with larger, wider candles (you can see more of the image without turning the candle), the candle tends to burn down a hole inside the candle so the outside doesn’t even melt. Does that make sense? To all in Australia. I have found the only place to buy wax paper is Coles (home brand).